← volunteers save the day! This is a stack of logs in the side yard of our 1/8 acre Minneapolis home – before I moved the stack out to the farm on Monday. This is the second of several such stacks to accumulate there after being inoculated. 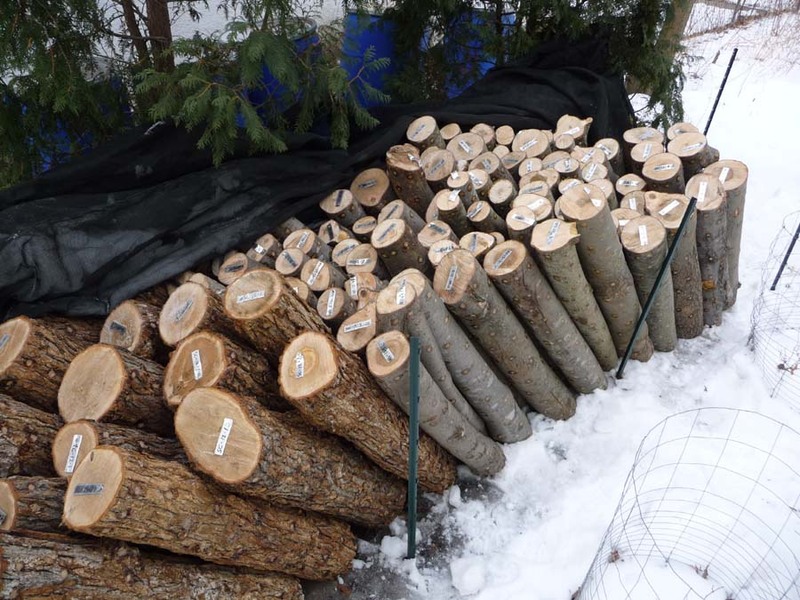 By the time these logs are moved to the farm, I may have moved them from where they are felled to a friend’s garage, from that garage to the inoculation workshop, from the workshop to the side yard nearby, and from the side yard to the Maplewood farm. When I have spent a couple of hours moving logs, I find myself fantasizing about a much simpler trip from a wood lot on one part of a property (where trees are felled) to another part (where logs are inoculated) to a last part of the same property (to a “laying yard” where logs are rested and fruited). There is one thing I might miss with less log moving: when would I get the time to fantasize or contemplate? Yes, there are some good things about urban farming after all!